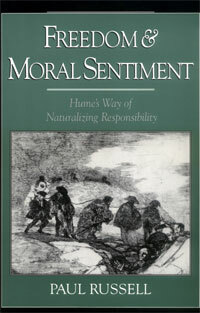 Paul Russell has provided a new interpretation of David Hume’s naturalism and moral sentiments and their connection to the reactive attitudes of Peter Strawson. In his discussion of freedom, Russell offers a concise statement of thestandard two-part argument against free will. …the well-known dilemma of determinism. One horn of this dilemma is the argument that if an action was caused or necessitated, then it could not have been done freely, and hence the agent is not responsible for it. The other horn is the argument that if the action was not caused, then it is inexplicable and random, and thus it cannot be attributed to the agent, and hence, again, the agent cannot be responsible for it. In other words, if our actions are caused, then we cannot he responsible for them; if they are not caused, we cannot be responsible for them. Whether we affirm or deny necessity and determinism, it is impossible to make any coherent sense of moral freedom and responsibility. But then Russell attempts to reconcile some chance with otherwise determined actions. His suggestion is very close to a resolution of theRandommness Objection, but we suggest that he should move randomness back into the alternative possibilities and allow both will and action to beadequately determined. Then “will” as an act of determination agrees better with the common sense use of the term. The success or force of the antilibertarian argument, it seems, depends very largely on a particular interpretation of the libertarian position. Contrary to what compatibilists generally suppose, liberty of indifference and liberty of spontaneity may not be incompatible with each other. What, then, is the alternative interpretation to be considered? According to the antilibertarian argument (on the classical interpretation), if actions were not caused, then it would be unreasonable to attribute them to the agent or hold the agent responsible for them. The target here is liberty of indifference interpreted, on this account, as the view that our actions are uncaused. However, it may be argued that this is not the only position which is available to libertarians or defenders of “free will”. They may locate the requisite “break in the causal chain” elsewhere. It is important to distinguish between the following two types of liberty of indifference: a notion of liberty of indifference which suggests that actions are not caused or determined by antecedent conditions and a notion of liberty of indifference which suggests that our willings are not caused or determined by antecedent conditions (our willings being understood as the causal antecedents of action). For convenience, let us call the first liberty of indifference in acting (LIA) and the second liberty of indifference in willing (LIW). Both of these notions of liberty of indifference are vulnerable to well-known objections, but LIA is open to some objections to which the LIW is not liable.The libertarian may seek to evade the antilibertarian argument by conceding that our actions must be caused by our antecedent willings, thereby rejecting LIA, but refuse to abandon or reject LIW. By rejecting LIA, the defender of “free will” can avoid the main thrust of the antilibertarian argument, namely, that liberty of indifference would renderactions random and capricious and would make it impossible to attribute such actions to the agent. Those who accept LIW may, quite consistently, maintain that free action is determined by the antecedent willings of the agent and thus reject any suggestion that they licence random events at the level of action. Any randomness that LIW permits (assuming, as we do, that any alternative metaphysical conception of causation is excluded) occurs only at the level of the determination of the will. The presence of random events at the level of willing will not prevent an agent from enjoying liberty of spontaneity. Such an agent may well be able to act in accordance with the determinations of her (capricious) will. Nor would it be impossible to attribute actions to such an agent, because it would be her (capricious) motives, desires, and so on, which caused them. Clearly, then, liberty of indifference, interpreted in terms of LIW, is compatible with, and thus need not exclude, liberty of spontaneity. It is true that the actions of an agent who enjoys LIW will be quite unpredictable, and it is also true that her future actions will not be amenable to the conditioning influences of punishments and rewards. In this way, LIW is still liable to other serious criticisms (especially if one interprets responsibility in terms of amenability to the conditioning influence of rewards and punishments). However, the actions of an agent who enjoys LIW share much with those of an agent whose will is necessitated by (external) antecedent causes. Liberty of spontaneity does not require that agents be able to determine their own wills, and it therefore makes little difference, on the face of it, whether our wills are determined by external causes or are merely capricious. In this way, it may be argued that the (classical) antilibertarian argument is not straightforwardly effective against the libertarian position when the notion of liberty of indifference is interpreted in terms of LIW rather than LIA. It is, perhaps, tempting to suggest that the significance of these observations lies with the fact that they reveal certain limitations of the antilibertarian argument and that they may, therefore, open up new avenues of defence for the libertarian position. I believe that the real interest and significance of these observations lies elsewhere. What they bring to light are certain serious inadequacies in the spontaneity argument. An agent who enjoys LIW may also enjoy liberty of spontaneity, and this is a point that many defenders of classical compatibilism may find rather awkward and embarrassing. It follows from the fact that liberty of spontaneity is compatible or consistent with LIW that we may reasonably hold an individual responsible for actions caused by her capricious, random willings. Clearly, then, there is, in these circumstances, as much, or as little, reason to hold an agent responsible for actions due to a capricious will as there is to hold an agent responsible for actions that are due to a will that is conditioned by antecedent external causes. Both agents may equally enjoy liberty of spontaneity. If we have reason to conclude that LIW constitutes an inadequate foundation for freedom and responsibility, then surely we must also conclude that there is more to freedom and responsibility than liberty of spontaneity. In short, compatibilists must either concede that agents whose actions are due to LIW are nevertheless free and responsible or else acknowledge that the spontaneity argument provides us with an inadequate and incomplete account of freedom and responsibility.